Crocodile breeding season varies according to the species' envionment, but regardless of these differences, all female crocodiles appear to follow one of two birthing practices: they either build a nest or dig a hole. The time between mating and egg laying varies slightly between species. 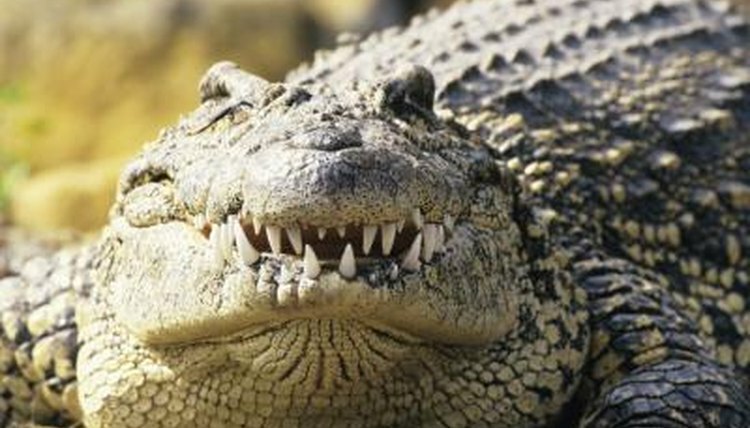 American crocodiles typically have a three-week development period between mating and laying eggs, while some saltwater crocodiles take four to six weeks. During that period the fertilized eggs go through three stages. First, a clear, thick albumen forms around the fertilized yolk. This is then held in shape by a leathery membrane around which the shell forms. During this process the embryo starts to develop. A crocodile can lay between 40 to 90 eggs during one birthing. The female searches for suitable spots to give birth and may dig a few trial holes or build a partial nest. When she's ready, she lays her eggs at night. The eggs pass out through the cloaca. The process takes 30 to 40 minutes, during which time the female goes into a trance-like state. When she has finished, she covers the hole, or nest, and stays nearby. She doesn't move her eggs during incubation, which lasts for between 65 to 95 days depending on climate temperature. How Long Is the Gestational Period for Geese?